156 pages, 8.5" x 11"
For over 100 years, Michigan and Trumbull was the scene of some of the most exciting baseball ever. This book, the collaborative work of 34 members of the Society for American Baseball Research (SABR), portrays 50 classic games at the corner, spanning the earliest days of Bennett Park until Tiger Stadium’s final closing act. From Ty Cobb to Mickey Cochrane, Hank Greenberg to Al Kaline, and Willie Horton to Alan Trammell, the illustrious names of Tiger legends shine forth in these pages. A must-read for those who love the crack of the bat, the glory of green grass, and tales of great games well told. Contributors include: David W. Anderson, William M. Anderson, Will Bennett, Rich Bogovich, Raymond Buzenski, Marcus W. Dickson, Scott Dominiak, Scott Ferkovich, David Fleitz, Brent Heutmaker, Maxwell Kates, Matt Keelean, Jeffrey Koslowski, Steven Kuehl, Marc Lancaster, Susan A. Lantz, Doug Lehman, Len Levin, Mitch Lutzke, Mike Lynch, John Milner, Jerry Nechal, Bill Nowlin, Dave Raglin, Richard Riis, Ruth Sadler, Jeff Samoray, Terry Sloope, Steve J. Weiss, Mike Whiteman, Phil Williams, Jim Wohlenhaus, and Gregory H. Wolf. E-book: Click here to download the e-book version of Tigers by the Tale: Great Games at Michigan & Trumbull for FREE from the SABR Store. Available in PDF, Kindle/MOBI and EPUB formats. Paperback: Get a 50% discount on Tigers by the Tale: Great Games at Michigan & Trumbull paperback edition from the SABR Store ($10.99 includes shipping/tax). 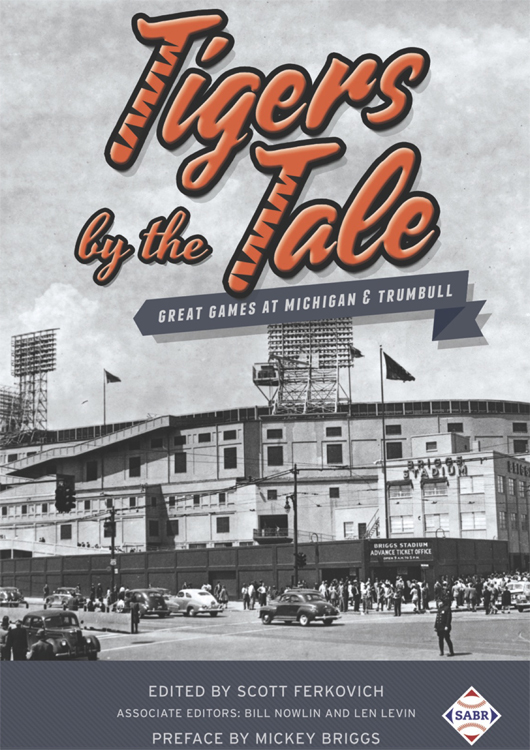 E-book: Click here to purchase the e-book version of Tigers by the Tale: Great Games at Michigan & Trumbull for $6.99 from the SABR Store. Available in PDF, Kindle/MOBI and EPUB formats. Paperback: Get the paperback edition of Tigers by the Tale: Great Games at Michigan & Trumbull from the SABR Store ($20.99 includes shipping/tax). For more than 40 years, SABR and its members have led the way in publishing the best baseball historical and statistical research. Our publications program is shifting to take advantage of new methods of publishing. Not only will we continue to publish new books like Can He Play? A Look At Baseball Scouts and Their Profession (released in December 2011); Opening Fenway Park in Style: The 1912 World Champion Red Sox (May 2012); Detroit Tigers 1984: What A Start! What A Finish! (December 2012); Sweet '60: The 1960 Pittsburgh Pirates (April 2013); Inventing Baseball: The 100 Greatest Games of the 19th Century (July 2013); Thar's Joy in Braveland: The 1957 Milwaukee Braves (May 2014); Detroit the Unconquerable: The 1935 Detroit Tigers (December 2014); Winning on the North Side: The 1929 Chicago Cubs (February 2015); Scandal on the South Side: The 1919 Chicago White Sox (June 2015); The Team That Time Won't Forget: The 1951 New York Giants (December 2015); and Nuclear Powered Baseball/The Simpsons (February 2016), which showcase the best efforts of SABR's members, chapters and committees, but new technology makes it possible for us to bring out-of-print titles like Run, Rabbit, Run: The Hilarious and Mostly True Tales of Rabbit Maranville (February 2012), Great Hitting Pitchers (March 2012), Nineteenth Century Stars (August 2012); Batting (January 2013); The Fenway Project (September 2013); and '75: The Red Sox Team That Saved Baseball (April 2015) back again. This page was last updated October 31, 2017 at 4:07 pm MST.